Crane was twenty-two years old, temporarily living back in Ohio and employed dropping handbills at doorsteps when he wrote "Chaplinesque" in October 1921. He was inspired to write the poem after seeing The Kid, comedian Charlie Chaplin's first full length film, in which Chaplin's Little Tramp character befriends an abandoned child. In a letter to a friend, Crane wrote -- "Comedy, I may say, has never reached a higher level in this country before. We have (I cannot be too sure of this for my own satisfaction) in Chaplin a dramatic genius that truly approaches the fabulous sort. I could write pages on the overtones and brilliant subtleties of this picture...My poem is a sympathetic attempt to put into words some of the Chaplin pantomime, so beautiful, and so full of eloquence, and so modern." Crane was not alone in his admiration for Chaplin. In the early 1920s, film was beginning to be accepted as an art form and Chaplin, the movie world's biggest star, was widely recognized as a master of this new manner of creating works of art. 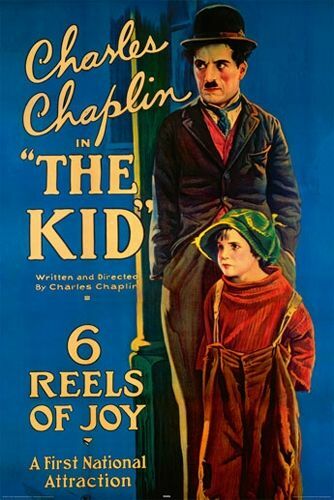 Reviewing The Kid for The New Republic, critic Francis Hackett wrote "[Chaplin's] wisdom, his sincerity, his integrity, all exhibited in this film, should go some way to revolutionize motion-picture production in this country. From an industry The Kid raises [film] production to an art." In a letter to a friend who did not understand "Chaplinesque" Crane explained -- "I am moved to put Chaplin with the poets (of today)...he, especially in The Kid made me feel myself, as a poet, as being 'in the same boat with' him. Poetry, the human feelings [are] so crowded out of the humdrum, rushing, mechanical scramble of today that the man who would preserve them must duck and camouflage for dear life to keep them or keep himself from annihilation. I have since learned that I am by no means alone in seeing these things in the buffooneries of the tragedian, Chaplin...and in the poem I have tried to express these 'social sympathies' in words corresponding somewhat to the antics of the actor." "Chaplinesque" was published in the Paris-based literary magazine Gargoyle in December 1921 and included in Crane's collection of poems, White Buildings, published in 1926. Two years after writing "Chaplinesque" Crane met Charlie Chaplin. In the autumn of 1923, the novelist and critic Waldo Frank, a mutual friend, unexpectedly brought Chaplin to Crane's Greenwich Village apartment. Crane wrote of the experience to his mother -- "I had just got my pajamas on last night when there was a rap on the door. I opened and in walked Waldo Frank -- behind him came a most pleasant-looking, twinkling, little man in a black derby...I was quickly urged out of my nightclothes and the three of us walked arm in arm over to where Waldo is staying...All the way we were trailed by enthusiastic youngsters. People seem to spot Charlie in the darkness." Crane and Chaplin stayed out all night talking of poetry and of Chaplin's recent romance with screen star Pola Negri. "Our talk was very intimate," Crane wrote his mother. "He has been through so much, is very lonely (says Hollywood hasn't a dozen people he enjoys talking to or who understand his work) and yet is so radiant and healthy, wistful, gay and young. He is 35, but half his head is already grey. You cannot imagine a more perfect or natural gentleman. But I can't go on more now. Stories (marvelous ones he knows!) told with such subtle mimicry that you rolled on the floor. Such graceful wit, too -- O that man has a mind." Crane and Chaplin made plans to have dinner together the following evening but the dinner never came to pass. The two men met only once again, in 1928, when Crane was in Los Angeles working as a personal assistant to a wealthy man and hoping the change of scene would help advance his writing of his epic poem, The Bridge. Crane encountered Chaplin at a restaurant and wrote of the meeting to Waldo Frank -- "I stopped for a moment in passing to say hello...I later sent him an inscribed copy of White Buildings along with a letter, but never got any response further than a formal letter from his secretary acknowledging receipt of same, etc...I couldn't press matters much further...He was simply too busy otherwheres to be interested...all the stars have built walls of mystery about themselves as impregnable as Carcasonne!" Published in 1930, "The Bridge" was Crane's reply to T.S. Eliot's "The Waste Land." Crane admired "The Waste Land" but, excited by new developments such as motion pictures, he rejected the bleak view of the twentieth century that Eliot put forth. "Like Emerson and Whitman, [Crane] is certain that every great poet represents a new beginning...In a period obsessed with its belatedness, Crane simply refused to accept that the modern world was diminished or disenchanted, and his poetry, at its best, uses language strangely and vitally enough to vindicate its claim to ecstasy," wrote Adam Kirsch in The New Yorker. Collected Poems, first edition, 1933. Crane's deepening alcoholism made it difficult for him to write and his increasingly erratic, argumentative behavior began to alienate members of his wide circle of friends. In 1932, three months short of his thirty-third birthday, Crane drowned after jumping from the stern of the S.S. Orizaba while on a voyage back to New York after a long stay in Mexico. The Collected Poems of Hart Crane, edited by his friend Waldo Frank, was published in 1933. Crane is considered a major figure in modern American poetry but his relatively small body of work and its uneven quality sometimes call into question his place in the canon. Ohioana Authors (WOSU and the Ohioana Library). Poets.org (The Academy of American Poets). Fisher, Clive. Hart Crane: A Life, 2002. Hammer, Langdon (ed.). Hart Crane: Complete Poems and Selected Letters, 2006. Mariani, Paul. The Broken Tower: A Life of Hart Crane, 1999. Schickel, Richard (ed.). The Essential Chaplin, 2006. Unterecker, John. Voyager: A Life of Hart Crane, 1969.